What's the Best Color for Decorating a Bedroom? 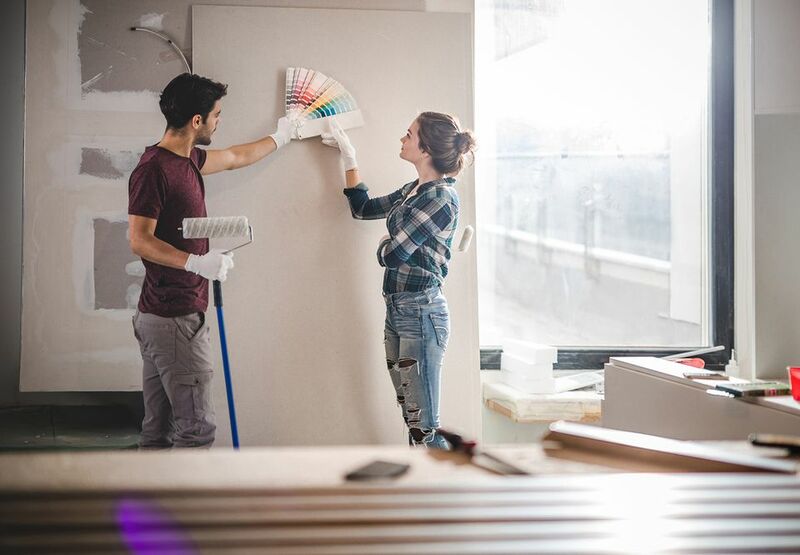 The number 1 question when it comes to decorating a bedroom is, “What color is the best?” That’s actually an excellent question, but unfortunately, there is no definitive answer. Ultimately, the best color for your room is the one you like the most. Still, certain colors are generally more suited to the bedroom, since the majority of people want to create a relaxing vibe in their sleeping space, and some colors achieve this more effectively than others. Color psychology, which studies how color affects mood, is a very helpful guide when it comes to choosing the right color for the bedroom. Long associated with nobility, deep shades of purple are calming, elegant and rich looking. Use dark purples like eggplant and plum for a sumptuous, soothing touch in your bedroom. Paler tints of lavender, lilac and periwinkle are tranquil as well but create a younger, more feminine vibe. Bright shades of purple are best left to children’s bedrooms or used as accents if you want a dramatic touch. More people claim blue as their favorite color than any other. It’s also one of the most popular colors for bedroom décor, thanks to its serene, peaceful feel and decorating versatility. Use blue with any other color – it complements them all and works to keep brighter or more stimulating tones under control. If you want sophisticated, quietly elegant style, look to the deep shades of navy or indigo. Mid-tone blues are bedroom classics, creating the perfect resting environment. Lighter tints feel casual and relaxed, without the weightiness that the darker blues carry. The only downside to decorating with blue is that in a room with poor lighting, the color can take on a gray tinge. Associated with freshness, growth, and life itself, green creates a feeling of vitality and health, yet isn’t overly stimulating. This makes it another excellent choice for the bedroom. Other than the brightest shades of Kelly or lime green, you can mix and match just about every shade of this versatile color and come up with a winning palette. Cheerful, playful and innocent, yellow feels warm and sunny. It’s a stimulating color, which makes it perfect for the living room and kitchen, but not as good a choice for quiet areas like bedrooms. If you want to decorate your bedroom with this happy hue, either choose a slightly muted shade like mustard, gold or butter; pick a soft pastel yellow, or limit brighter yellows to accents throughout the room. Warm, cheerful and vibrant, pure shades of orange stimulate creativity, appetite and all of the senses. This makes orange a good color for the kitchen, but a riskier choice for the bedroom. If orange is your decorating choice, either choose richly pigmented shades such as pumpkin, tomato or persimmon; a brownish orange such as terracotta, a burnt orange or rust, or a soft tints such as apricot, pale coral or peach. If you like bright, retro shades of pure orange, use them as accents. The prima donna of the spectrum, red is the color of fire, romance, and excitement. It’s best used as an accent in the bedroom, rather than in a starring role. If you love dramatic flair, however, and are determined to use red on your walls or floor, keep it under control by picking a shade that is somewhat muted: wine, burgundy, brick, maroon or rose are all excellent choices. Hot hues like cherry, strawberry, fire engine red or candy apple are best kept to accents on bedding or artwork. Red’s more innocent sister, pink is naturally red tinted with white. It’s a classic color for a girl’s bedroom, but there are many sophisticated shades of pink that work very well in the master bedroom as well. Salmon, coral, geranium, and Marsala are all quite grownup, yet retain the feminine charm that makes pink so popular. Pastel pink is another option, but if you share your bedroom with a man, you’ll likely encounter some resistance to decorating with soft, girlie pinks. Brighter shades of pink, such as magenta, fuchsia, bubblegum, and hot pink are fun touches for bedding and other accents, but best kept off the walls or floors in your master bedroom. The color of the earth, brown is nurturing, stabilizing and comforting. This, along with its versatile nature, makes it one of the most popular colors for bedroom décor. You can decorate your entire room in a palette of brown for a restful vibe, or match it to any other color for a little more excitement and contrast. From the darkest chocolate to the softest tan, it’s almost impossible to go wrong with brown in the bedroom. Once considered too gloomy for the bedroom, but now a centerpiece of contemporary style, gray is calm and subdued, yet coolly sophisticated. An entire bedroom of gray can be too much, but you can still use it as your primary color very successfully. Just cheer up this somber tone with a few touches of another neutral, a pure color or white. Every bedroom needs a few touches of black. This useful color is the perfect foil for brights, adds maturity to pastels, lifts neutrals out of the blahs, harmonizes mixed palettes and is a classic with white. Still, unless you love all things goth or live for dramatic style, you’ll want to limit black’s role to that of an accent, not a star. It’s pure and innocent, clean and fresh, relaxed and tranquil. You can’t go wrong with white in the bedroom. By its very nature as a lack of color, it works perfectly with any other hue, including neutrals, brights, darks, and pastels. Use white as your primary color, or as an accent. Either way, it’s a classic. The only caveat to decorating a bedroom with white is that it’s generally best to avoid the most intense, pure whites, as these can be a bit sterile. Are You Making These Exterior Paint Color Mistakes?